NASA’s New Horizons probe has already shown that its icy target, more than 4 billion miles away on the solar system’s edge, looks like a cosmic snowman — but a higher-resolution version of the picture reveals the snowman to have an eerie pair of “eyes” set in what looks to be a deep depression. 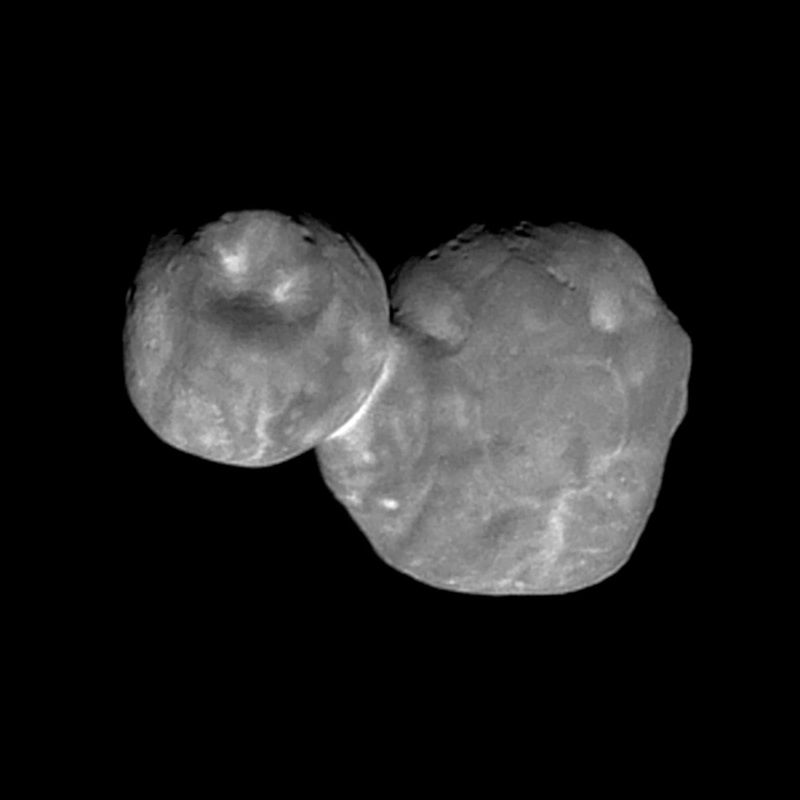 The 19-mile-long object — which is known by its official designation, 2014 MU69, or by its informal nickname, Ultima Thule — consists of what looks like two balls of ice and rock stuck together. Scientists suspect that there are many similar objects, known as contact binaries, in the broad ring of icy material known as the Kuiper Belt. New Horizons zoomed past 2014 MU69 back on New Year’s Day, snapping hundreds of pictures as it passed. Since then, the piano-sized probe has been transmitting data at a slow, deliberate speed of roughly 1,000 bits per second. The first pictures were fuzzy, but now New Horizons is raising the resolution. The picture released today is based on imagery that was acquired by the Multicolor Visible Imaging Camera, part of the probe’s Ralph instrument suite, from a distance of 4,200 miles.